The Ogilvies are one of the most distinguished families in Scotland and take their name from Gillibride, second son of Ghillechriost, Earl of Angus. He bestowed the lands of Ogilvie and Easter Powrie on his younger son Gilbert in 1177 having been granted a Barony of the lands by William the Lion around 1163. Patrick de Ogilvy appears on the Ragman Rolls swearing fealty to Edward I in 1296 but his two sons both supported King Robert the Bruce. Patrick obtained the lands of Kettins in Angus and his descendant Sir Walter, having wed the heiress of the Ramsays of Auchterhouse, obtained her barony. The Ogilvies were also appointed the first Hereditary Sheriffs of Angus. On the death of his son Alexander, the chiefship passed to his brother, Sir Walter, Lord High Treasurer of Scotland, who married the heiress of Lintrathen and built the tower of Airlie. His grandson Sir James Ogilvy became Lord Ogilvy of Airlie in 1491 and James, 8th Lord Ogilvy was created Earl of Airlie in 1639, and became the recognised chief of all the Ogilvies. The Ogilvies of Airlie adhered loyally to the Stuart cause throughout the troubled times from 1639 to 1745. James, 2nd Earl of Airlie was captured at the Battle of Philiphaugh in 1648 which put an end to Montrose's campaign, he was imprisoned in St Andrew's Castle but escaped the night before his execution disguised in his sister's clothes. The Ogilvies were also "out" in 1715 and 1745. At Culloden, an Angus Regiment was lead by Lord Ogilvie, son of the 5th Earl of Airlie who had barely reached the age of 20 years. He escaped to France but was pardoned and the Earldom was restored in 1826. Like other clans the Ogilvies also had their feuds with their neighbouring clans; against the Lindsays and later the Campbells who in 1640 attempted to destroy the "Bonnie House of Airlie". The Ogilvies later had their revenge for this act, by setting fire to Castle Campbell near Dollar. Other cadet branches of the Ogilvies became Earls of Findlater in 1638 and Seafield in 1701. Today the Ogilvie seat is at Cortachy although they still hold Airlie Castle which was rebuilt after the Campbell destruction. BADGE: Seorsa luibh (anchusa) evergreen alkanet. THE Siol Gillichriosd, or Gilchrist�the Race of Gilchrist, claims descent from a Maormor of Angus of that name, one of the seven great hereditary chiefs of Scottish districts who bore this designation. When the title of Maormor came to be replaced by that of Earl in the time of David I., Gillibride, son of Gilchrist, became Earl of Angus. While the Earl�s eldest son succeeded to his father�s title, and the second, Magnus, inherited, through his mother, the Earldom of Caithness, the third son, Gilbert, became ancestor of the Ogilvies. By Gaelic enthusiasts the name is taken to mean a fair or yellow-haired young man�Gille-Bhuidhe, but it is more likely to be derived from lands so called, of which Gilbert received a charter in 1172. There is a Glen Ogilvie in the parish of Glamis, the Ogilvie country at the present day. Gilbert�s descendant, Sir Patrick de Ogilvie of Western Powrie, was a steady adherent of King Robert the Bruce, and received from him a charter of the lands of Kettins in Forfarshire. From his elder son Alexander descended the Ogilvies of that ilk, now long extinct. The younger son, Patrick, obtained from his nephew, Sir Patrick of Ogilvie, the family estate of Western Powrie, and by marriage with Marjory, heiress of Ramsay of Auchterhouse, added that estate to his possessions. His son, Walter Ogilvy, on the death of his uncle, Sir Malcolm Ramsay, in 1365, succeeded to the hereditary Sheriffdom of Forfar. He is said also to have acquired the barony of Cortachy in 1369, and it was his second son and heir, Sir Walter Ogilvy of Auchterhouse, Sheriff of Forfar, in whose person the family first made its way into the limelight of history. The incident took place in 1391. King Robert II. had only succeeded to the throne in the previous August, and the rule of Scotland was practically in the hands of his unscrupulous brother, Robert, Earl of Fife, better known by his later title of Duke of Albany. Another of the King�s brothers, Alexander, Earl of Buchan, himself better known as the Wolf of Badenoch, had already shown his contempt for all authority by plundering the lands of the Bishop of Moray, and burning the Bishop�s Cathedral and town of Elgin. Forthwith, following his father�s example, the "Wolf�s" natural son, Duncan Stewart, at the head of a raiding host of the Robertson clan and others, suddenly burst out of the Grampians and proceeded to plunder, burn, and slay in the shire of Angus. Ogilvy of Auchterhouse, as Sheriff, promptly gathered his people, and with Sir Patrick Gray and Sir David Lindsay of Glenesk, came up with the raiders at Glen Brierachan, eleven miles north of Gasklune. Though much inferior in numbers, he did not hesitate to attack. But, though clad in steel, he and his little party were no match for the fierce caterans. And while Ogilvy and his half-brother, with other lairds and some sixty followers were slain, Gray and Lindsay were grievously wounded, and only with difficulty carried from the field. For he nae ways wad grant to yield. In that tremendous conflict north of Aberdeen against Donald of the Isles in 1411, Sir Alexander and his eldest son, George Ogilvy, were among the slain. The line of Sir Alexander's next son, Sir Patrick, ended with his granddaughter, who married James Stewart, Earl of Buchan, half-brother of King James II. His next son, Sir Andrew of Inchmartin, was ancestor of the second Earl of Findlater (son-in-law of the first Earl), who in strict line of blood carried on the Chieftainship of the Clan. His descendant, the fourth Earl, was the distinguished Scottish statesman of the days of William and Mary, and Queen Anne, and on his own merits was created Earl of Seafield. That line ended, however, at the death of the seventh Earl of Findlater and fourth Earl of Seafield, when the latter title passed to the son of his aunt, who had married the Chief of the Grants. Meanwhile, Sir Walter, younger brother of the "gracious gude Lord Ogilvy," had acquired the estate of Lintrathen by marriage with an heiress, it is believed, of the Durward family, and had become High Treasurer of Scotland under James I. Among his transactions he conveyed to his youngest brother John the estate of Inverquharity. John�s son, Alexander Ogilvy of Inverquharity, by marriage and purchase acquired many valuable estates, and was an excellent man of affairs. In the end this ability was his undoing, and the tragic event in which he was concerned came within measurable distance of effecting the complete ruin of the Ogilvies. It was in 1445, when the House of Stewart was still fighting for its sovereignty against an array of turbulent nobles, and the lawlessness of the latter had not yet been brought to an end by the decisive action of James II. It happened that the wealthy monastery of Arbroath had appointed Alexander Lindsay, afterwards to be known as the Tiger Earl of Crawford, or Earl Beardie, to be their Justiciar. Finding that ferocious personage a somewhat expensive and troublesome protector, they deposed him and appointed Ogilvy of Inverquharity Justiciar in his place. To avenge the insult and repossess himself of the lucrative office, Lindsay mustered his vassals, and, reinforced by a large party of the Douglases, appeared before Arbroath. Ogilvy also gathered his friends and followers, and was helped by Sir Alexander Seton of Gordon, afterwards Earl of Huntly, who happened at the moment to be a guest at his house, and obliged by an ancient Scottish custom to fight for his host so long as the food he had eaten under his roof remained in his stomach. As the two forces faced each other, Lindsay�s father, the old Earl of Crawford, anxious to prevent bloodshed, came galloping between the lines. A common soldier, unaware of his rank, and annoyed at his interference, shot him dead. This greatly infuriated the Lindsays, who, rushing fiercely to the attack, cut the Ogilvies to pieces. The latter made such a gallant resistance that nearly every man fell, including Inverquharity himself, and Seton only narrowly escaped. Lindsay then proceeded to lay waste the Ogilvy country, burning, slaying, and plundering throughout the district. The house of Inverquharity, however, survived the disaster, and in 1626 was raised to the rank of baronetcy, which it still enjoys, though its original patrimony was disposed of in the eighteenth century, and its seat is now Baldovan, near Dundee. At the same time the elder line of Lintrathen was also advancing in possessions and power. The son of the Treasurer acquired the lands and castle of Eroly or Airlie in 1459, and his son, Sir James Ogilvie of Airlie, who was sent as Ambassador to Denmark in 1491, was made a Lord of Parliament as Lord Ogilvy in that year. The second Lord Ogilvie of Airlie married a sister of the first Earl of Montrose, and the third married Margaret, daughter of David, eight Earl of Crawford. The fourth Lord�s eldest son fell at Pinkie in 1547, and the seventh Lord was made Earl of Airlie by Charles I. in 1639. A year earlier Lord Ogilvy of Deskford, representative of the second son of the High Treasurer of James I.�s time, had been made Earl of Findlater, so that the Ogilvies had now two Earldoms to their name. The Earl of Airlie was a devoted Royalist, who, joining the little army of the Marquess of Montrose, distinguished himself highly at that leader�s crowning victory, the battle of Kilsyth. He and his family suffered severely for their adherence to the cause of Charles I. In 1640 the Earl of Argyll, head of the Covenanting Party, procured a commission from the Committee of Estates to proceed with fire and sword against those who had not signed the Covenant, and who were therefore termed "enemies to religion." This commission he proceeded to turn to account for the destruction of families whom he considered unfriendly to his own. Among them were the Ogilvies. The Earl of Airlie was in England at the time, but his house was in the keeping of his eldest son, Lord Ogilvy, when it and Forthar, another seat of the family, were taken, pillaged, and burned by Argyll. Lady Ogilvy, it is said, was near confinement at the time and begged for delay upon that account, but Argyll refused, and turned her out remorselessly. The incident is commemorated in the well-known ballad, "The Bonnie House o� Airlie." By way of reprisal, when Montrose took the field, with the Earl of Airlie in his company, they crossed the Ochils and burned Argyll�s own stronghold of Castle Campbell, above Dollar, which still remains as they left it, a ruin. Airlie�s second son, Sir Thomas Ogilvy, raised a regiment for the Royal cause, and fell at the battle of Inverlochy, where Argyll, taking refuge in his galley, saw his forces cut to pieces by Montrose. In the autumn of the same year, when Montrose suffered his first and last defeat at Philiphaugh, below Selkirk, Airlie�s eldest son James was taken prisoner. While the Covenanters were butchering and hanging at Newark and elsewhere the captives they had taken, Ogilvy was sentenced to execution at St. Andrews, but on the night before the sentence was to be carried out he made a romantic escape in the attire which his sister managed to exchange with him. A member of the clan took part in another romantic event of that time. George Ogilvy of Barras was governor of Dunnottar Castle when that stronghold was besieged by Cromwell�s troops, and it was by his connivance that the wife of the neighbouring minister of Kinneff saved the Scottish regalia by carrying it through the English army in a bundle of flax. In 1715, when the Earl of Mar took arms for Queen Anne�s brother as "James VIII. and III.," he was joined by James, Lord Ogilvy, elder son of the third Earl, and after the collapse of the rebellion at Sheriffmuir he was attainted. He received a pardon from the Crown in 1725, but was not enabled to assume the family honours. On his death without issue, however, in 1731, his younger brother John assumed the title as fourth Earl, Lord Ogilvie having been attainted before the death of his father, the third Earl, in 1717. The family and clan, nevertheless, remained strongly Jacobite; and after the landing of Prince Charles Edward in 1745 the Earl�s eldest son, David, Lord Ogilvy, joined the Prince at Edinburgh with a following of 600 men, chiefly of his own name. After the final overthrow of the cause at Culloden he escaped through Norway and Sweden to France, where he commanded a regiment known as "Ogilvy�s," and rose to the rank of lieutenant-general. His wife was imprisoned after Culloden, but also escaped to France. Meanwhile, also in his father�s lifetime, he had been attainted, and though he received a pardon in 1778, and a Parliamentary removal of his disabilities in 1783, he was not empowered to assume the honours of his house. His son, titular Earl of Airlie, died unmarried in 1812. Thereupon the Earldom was claimed by Walter Ogilvie, younger son of the fourth Earl, but the English judges who were consulted by the House of Lords were of opinion that the attainders of his brother and uncle, though both of them had taken place before they could inherit the titles and estates, operated against him. It was not till 1826 that Parliament confirmed and restored the family honours to his eldest surviving son, who was then acknowledged as David, sixth Earl of Airlie. The seventh Earl was a Knight of the Thistle, a representative peer, and Lord High Commissioner to the Church of Scotland from 1872 to 1878. The eighth Earl, who was lieutenant-colonel of the 12th Lancers, took part in the Egyptian war, and was killed in action in the South African War, at Diamond Hill, near Pretoria, in 1900, after gallantly leading his regiment in a successful charge which saved the guns. The present Earl is his eldest son. The family estates comprise most of the old Ogilvy country, and extend far up the Grampian glens, while the chief seat is Cortachy Castle, overlooking the lovely and fertile valley of Strathmore. Ogilvy is a surname derived from a barony in the parish of Glammis, Forfarshire, which, about 1163, was bestowed by William the Lion on Gilbert, ancestor of the noble family of Airlie, and, in consequence, he assumed the name of Ogilvy. He is said to have been the third son of Gillibrede, or Gilchirst, maormor of Angus. In the charters of the second and third Alexanders there are witnesses of the name of Ogilvy. Sir Patrick de Ogilvy aheared steadily to Robert the Bruce, who bestowed upon him the lands of Kettins in Forfarshire. The barony of Cortachy was acquired by the family in 1369-70. 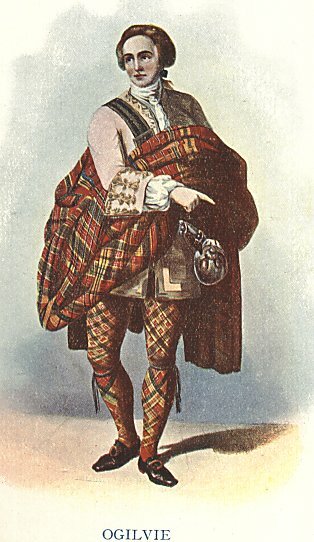 The "gracious gude Lord Ogilvy", as he is styled in the old ballad of the battle of Harlaw, in which battle the principal barons of Forfarshire fought on the side of the Earl of Mar, who commanded the royal army, was the son of Sir Walter Ogilvy of Auchterhouse, slain in a clan battle with the Robertsons in 1394. For he nae ways was grant to yield". His eldest son, George Ogilvy, was also slain. Lord Ogilvy, the first title of Airlie family, was conferred by James IV, in 1491, on Sir John Ogilvy of Lintrathen. James, seventh lord Ogilvy, was created Earl of Airlie, in 1639. The title of Lord Ogilvy of Deskford was conferred, 4th October 1616, on Sir Walter Ogilcy of Deskford and Findlater, whose son, James, second Lord Deskford, was created Earl of Findlater, 20th February 1638. He was descended from Sir Walter Ogilvy of Lintrathen, high treasurer of Scotland. The clan Ogilvy are called "the Siol Gilchrist", the race or posterity of Gilchrist. In 1526, the Mackintoshes invaded the country of the Ogilvies, and massacred no fewer than 24 gentlemen of the name. A feud between the Campbells and the Ogilvies subsisted for several centuries. In Pitcairn's Criminal Trials we find James Ogilvy complaining, on 21st October 1591, that a body of Argyll's men had attacked him when residing peaceably in Glenisla, in Forfarshire, which anciently belonged to the Ogilvies, killed several of his people, ravaged the country, and compelled him and his lady to fell for their lives. 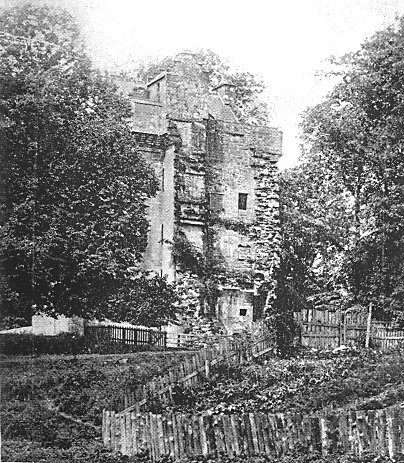 The Ogilvies had their revenge in 1645, for the burning of "the bonnie house of Airlie", and the other strongholds of the Ogilvies, when Castle Campbell, near Dollar, or the Castle of Gloom, its original name, was destroyed by them and the Macleans, and the territory of the Marquis of Argyll was overrun by the fierce and ruthless clan that followed Montrose, and carried fire and sword throughout the whole estates of the clan Campbell.